WiP THREAD FOR NEW USERS CONTEST, September. "Propping up the image" Intent: To help in better understanding how to have your figures using props. The Contest this month is about using props in your render, Props that your character(s)is using in some way. We have people standing by to give you hints and tips varying from how to import your prop to how to attach it to your figure, so that it moves with the figure, whatever pose you choose. 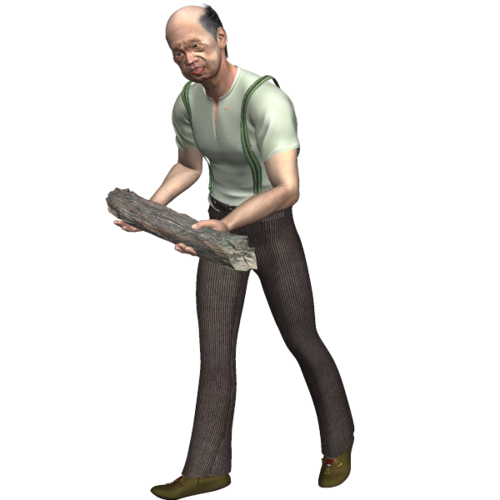 Props that you use will vary from person to person, of course, some may choose to use weapons, other to use tools, some may even want to just use something like a flower, a toy, a book, a domestic implement of some sort, their is no limt to what you can use. I attach a couple of images I did when I need to put some background people into an image, collecting wood, to show how varied props can be. 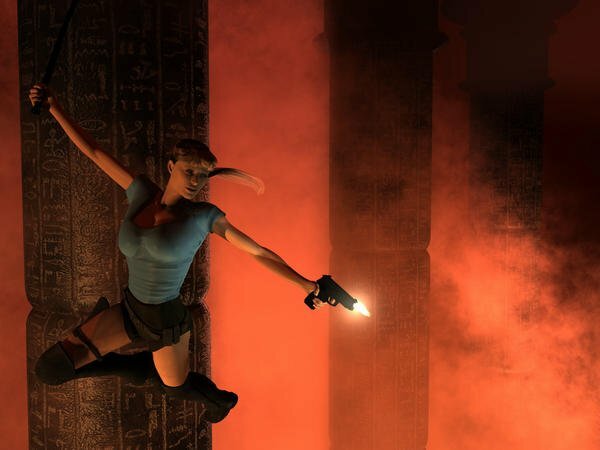 I'm going for a Tomb Raider vibe. Here's some screen shots of an image I'm working on. I have the right hand tracking a target helper which is parented to a bullwhip handle. The left had has a 9mm handgun parented to it. 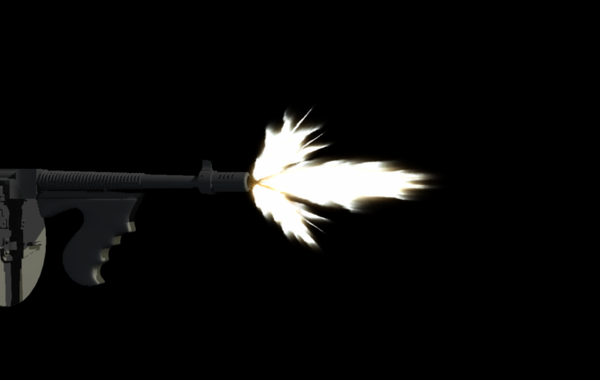 I wanted the gun to have a muzzle flash, so the gun in turn has a fire primitive and a light bulb parented to it. Generally I prefer to parent objects while the figure is in the T-pose. The hand tracking the target will follow the target, so it doesn't matter to much what position the figure is in, just so long as the hand (in this case) is near the target. 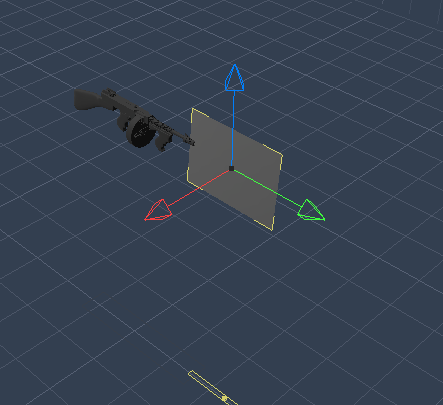 I generally prefer to not have the hand (or whatever) track the rotation of the target as it allows a little more flexibility for lining up the hand to the object. I am very interested in seeing more of how you do this (and the finished project). Question: are the 'helpers' you are describing/using standard with ver 4.5? For example -- "so the gun in turn has a fire primitive and a light bulb parented" -- I have figured out how to parent an item, but 'tracking' ? I havent seen that techinque in use (yet...still a newbie). I'm sorry, I should have clarified. I use Carrara 7 Pro. If D/S 4 has tracking, it would probably be a behavior or modifier. 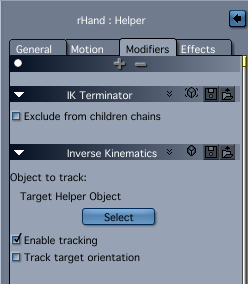 For example, in Carrara if I want the left hand to track an object or target I would click on the left hand and I can then choose from a list of modifiers. If any flavor of DAZ Studio has this capability, it would probably be accessed in a similar manner. Edited to add: The feet of the dinosaurs in this video I did a couple years ago are tracking targets. 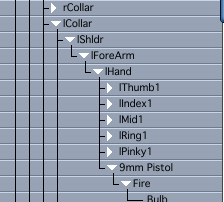 It allowed me to easily move the heads and bodies around using the rig's (bone structure) inverse kinematics without the feet moving etc. I think DAZ Studio has a pin feet option. ...And since I'm having a bout of insomnia, here's the final, (nearly) untouched version out of Carrara. I was going to post the straight render, but I had a small shadow artifact I painted out. Apparently I needed to smooth something and didn't. No other adjustments were done. Thanks EP, for those tips which I am sure will be very helpful if we get any New Users entering who use Carrara. 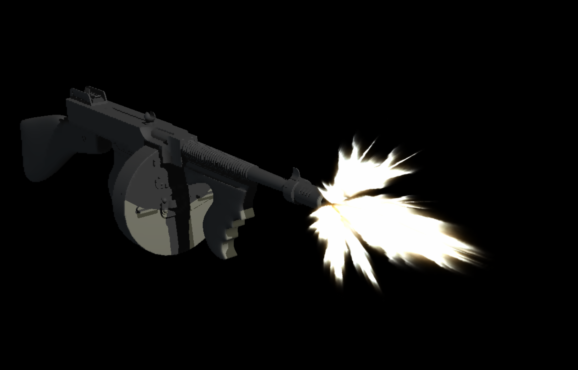 Question: using DAZ 4.5 is it possible to "I wanted the gun to have a muzzle flash, so the gun in turn has a fire primitive and a light bulb parented to it" as evilproducer describes? If so, how? YEP! 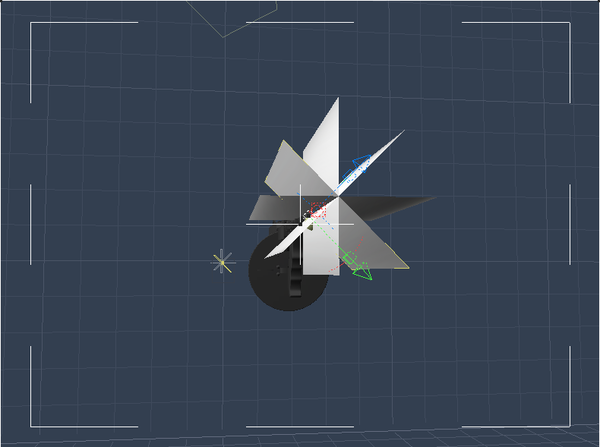 Step one find a primitive for your muzzle flash, I say start with a cone and use a deformer on it to give a nice shape. 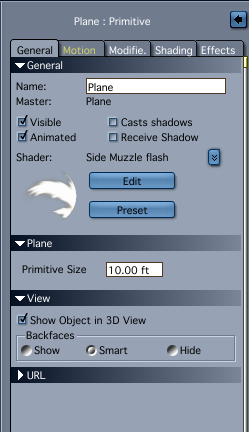 Then add a texture to the primitive in the Diffuse channel, that might take some work to get the texture looking good. Now with that done you have two different ways to go with adding it to the gun. One you just Parent the flash to the gun in the proper position. That works just fine, all by itself. Two parent a NULL to the gun and then parent the Flash to the Null. Why? So you can just edit the null's position to move the Flash. Sure that works with just the Flash parented as well just move the Flash you say. True, but with the null you can now parent your LIGHT to the null as well. So what? Now you move the null and your flash and your light BOTH move at the same time. I would use a STRONG point light for the Flash, be sure it is NOT inside or hidden by any of the Flash mesh. So just in front works the best for most cases. In some you might need two lights to get a good effect one at the Very end of the guns barrel and then the second at the end of the flash. Then you Parent the Gun to your figure and your flash and light follow every move of the gun. EDIT: Much more can and should be done, but first things first. By the way I was thinking High powered muzzle flash the kind that fully exits the Barrel. Sounds to me as if a null in DAZ Studio is similar to a target helper. The muzzle flash could also be created using a 2D billboard parented to the gun or a null as Jaderail suggested for a primitive. I know DAZ Studio can use alphas, so you could look for a 2Dflash image that you like and use that. I'll try and post a tutorial (Carrara based, but maybe somebody can provide relevant instructions in DAZ Studio). For various muzzle flashes, try searching for muzzle flash effects in Google or your search engine of choice. Sorry for the link breakage. Displayed fine for me when I previewed. Link Broke Thread for some users. Got Another? That one is killing me. Thank You ALL better now. Good Idea also, in DS you would need to keep the BB angled properly for it to catch good light but it would work just as well. 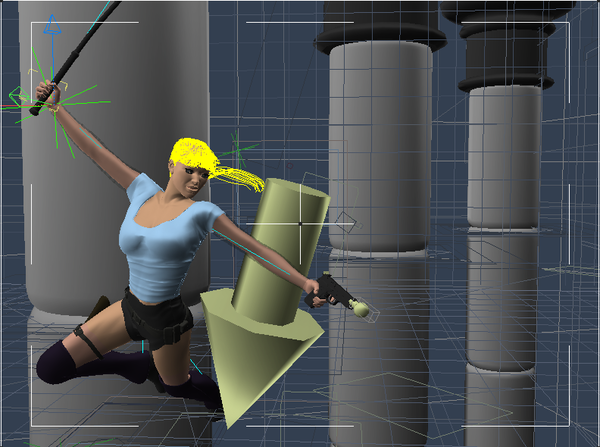 I think for the DS crowd the hard part will be learning just HOW to get that prop to be in the hand at all. Then they will need to pose the hand as well. Okay, Some/Lots of props auto Parent and come with a hand pose to use as well. But you will miss out on all those other items if you never know how to add anything you want to a characters hand and pose the hand to go with it. Then think beyond that, need to place a hand just so? All this will teach you the steps needed for all kinds of things once you think about what can be done. Does D/S have a glow available under the shaders? If so, I would add the color image map to the glow shader (if one exists), taht way there's not much need to worry about the lighting. Also in Carrara, if you have a png with a transparency, then there is no need to set up a separate alpha map. DS has a Ambient Glow but that will not produce a REAL light. It works well for low light scenes then a fill light is needed for the spill effect. Here is part of one I did about a year ago. The GUN is a free item I snagged from ShareCG. The Flash is a 3D effect from a pack here at DAZ3D. All this had to be posed by hand. By all this, I mean the Gun, hands and muzzle flash, the background set comes that way. EDITED TWICE to clear things up. Thanks Jad for the explanation, always want to do that so I want to try that someday this week. Nice pics guys. How come the newcomers challenge are now so much more interresting than when I was a beginner a little bit more than one year ago?! We are doing them in a different way now, trying to make them edutainment. And judging by your join date, you are still new enough user to join in. 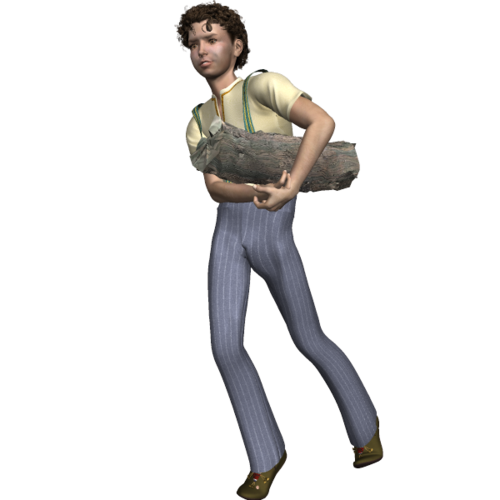 There's so much you can do when you understand how to parent an object, how to translate your object in 3D space, etc. This is an older one I did as a joke image. The Sorcerer's Apprentice style walking brooms each have a bucket that's parented to the hand. The one throwing the water had the water parented to the bucket. I have merged canyonmanterry Wip pictures into this main thread. Carrara's glow isn't an actual light either with one caveat: You can get it to emit light if you turn on GI in the renderer. 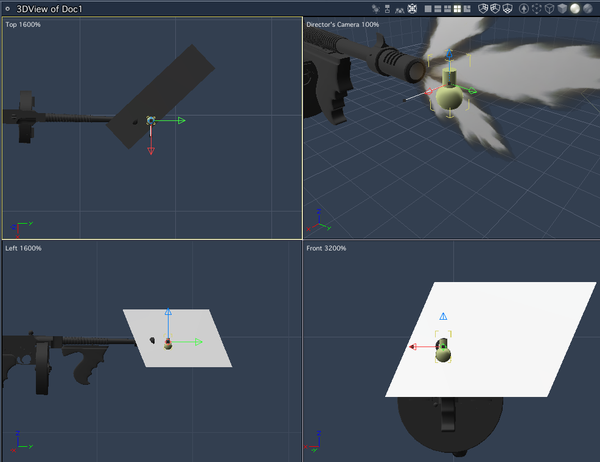 So here's what I did in Carrara: I used a muzzle flash image I found online, created a shader with it and applied it to a 2D plane primitive, adjusted the position of the primitive's hot point (or center of rotation) to coincide with the base of the muzzle flash image and parented the plane to a Tommy Gun model. I then used a four view screen to position the plane with the gun muzzle. I played around with a point at modifier to keep the image pointed at the render camera, but found I liked duplicating my plane so that I had four planes at 45º angles to each other. Looked much better in my opinion. I set the planes so that they don't cast shadows or receive shadows. I also added a bulb light with a three foot range, and a 25% falloff. The color was set to be complimentary to the muzzle flash. I parented the bulb to the gun as well and positioned it to be in the main part of the "flame." 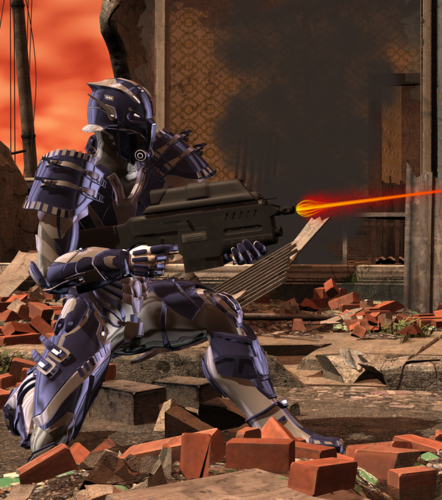 Once the muzzle flash parented to the gun, the gun can be parented to your figure and the attached flash will move with the gun. This will work for anything of course. You could have a flower pot with flowers parented to the pot and the pot parented in turn to somebody's hand. Great stuff, I probably could match that in DS if asked. Okay, I'm gonna pipe in and say I think we are doing the same thing we did last month. We are getting off on a tangent. Let's give this some time and see what questions the others would like answered. We might be leading people down the wrong road. The contest is about using props, and yes we are covering that but it's not about muzzle flashes per say. If we get more questions then we can cover that more. Any body got a question? We are ready to help. Its on sale atm....but listed for use with Poser (the description does mention DAZ) Just curious....working on my 'Flash Effects' and parented items as we speak. Its on sale atm....but listed for use with Poser (the description does mention DAZ) Just curious....working on my 'Flash Effects' and parented items as we speak. Yes it is, very nice set once you figure out how to use it. The Poser version stuff will drive you up the wall until you notice the DS versions work. It's not easy to tell them apart at first.